Ask Thomas R. Prince, professor of both health industry management and accounting information, what he is most proud of during his Kellogg School career and he immediately points to the opportunity he has had to help others. "As a professor, I've had the pleasure of mentoring students, involving them in my research, even helping them find employment upon graduation," Prince says. This is not surprising considering that Prince was once enrolled in Union Theological Seminary. Although he left seminary to study accounting at Mississippi State University and then earn his doctorate at the University of Illinois at Champaign-Urbana, his interest in helping others remained. Prince joined Northwestern University in 1962 as an assistant professor, was promoted to associate professor in 1965, to full professor in 1969, and served as the Accounting Department chair from 1968 to 1975. Besides being a longstanding member of the accounting faculty, Prince has been a faculty member in the Health Industry Management Program at Kellogg. 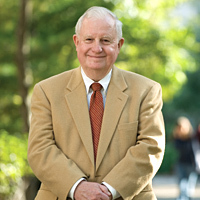 "Tom was really at the ground floor of the development of computer information systems and their application in healthcare," says Keith I. DeLashmutt Professor of Accounting Information and Management Robert P. Magee. "In the past five decades, he has remained very influential both in academics and in the professional world. At Kellogg, generations of students have benefited from his knowledge and willingness to help." Prince taught various Kellogg courses, including the core course, Accounting for Decision Making, and electives such as Information Technology in Healthcare Management and Financial Assessment and Performance Evaluation of Healthcare Entities. He also stayed active in the broader Northwestern University community, including a stint as president of Northwestern University Press. Other contributions include creating the Accounting Research Center at Kellogg, obtaining grants that supported research at the university and developing a proposal that created Northwestern Memorial Hospital in 1972. "Tom understood health education better than anyone, and no one was more devoted to Kellogg," says David Dranove, the Walter J. McNerney Distinguished Professor of Health Industry Management. "He was a true asset to the school. He helped forge the curriculum in the Health Industry Management Program, and he always brought innovative concepts into the school." Throughout his career, Prince studied information technology and financial management of healthcare entities, with emphasis on computer-based patient records, clinical integration, physician-hospital organizations, and medical technology. He has been a prolific contributor to the healthcare and information technology fields, having written more than 30 research articles and 10 books. In addition, he produced databases and studies on hospital closures and financially distressed facilities, and the use of information technology in healthcare management. Prince also directed and taught various programs with the American Medical Association and the American Dental Association, conducted research with the American Hospital Association and the Health Care Financing Administration and has consulted for many professional and corporate organizations and government entities. Most notably, he served for five years as a consultant to the founder of the National Center for Health Services Research and Development (now the U.S. Department of Health, Education and Welfare) during the Nixon Administration, and in 1969 authored the country's first document on patient healthcare confidentiality. With his teaching days behind him, Prince plans to find more time to relax, but his commitment to improving healthcare and helping people already has him busy. "I will continue to run the American Dental Association's Institute for Diversity in Leadership, work with selected healthcare entities and develop Your Choice Living, our new patient monitoring business for people living at home," Prince says. "I am excited about this new chapter in my life."